A Divalicious Musical Comedy, Priscilla Queen of the Desert is an uplifting story, based on the 1994 Oscarwinning hit movie, of three Sydney drag artists who hop aboard a battered old bus named Priscilla, on a journey of self-discovery which takes them on a road trip to the heartland of Australia searching for love, friendship and family. 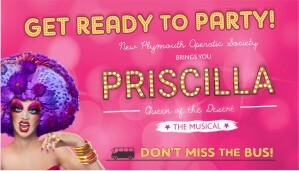 With a dazzling array of over 500 outrageous costumes, 200 magnificent headdresses, a spectacular bus and a parade of dance floor classics including "Don’t Leave Me This Way", "I Will Survive", "I Love the Nightlife", "Go West", "Hot Stuff", "Colour My World" and "Shake Your Groove Thing", Priscilla will be a Just-wanna have fun spectacular. Priscilla, Queen of the Desert – The Musical is set to run at New Plymouth’s TSB Showplace from Thursday 20 June 2019. Make sure you don't Miss the Bus!